Hawkman Returns In New Miniseries! Even as DC Rebirth continues to roll on, Hawkfans had precious little information about Hawkman coming down the pipeline (read: absolutely nothing). 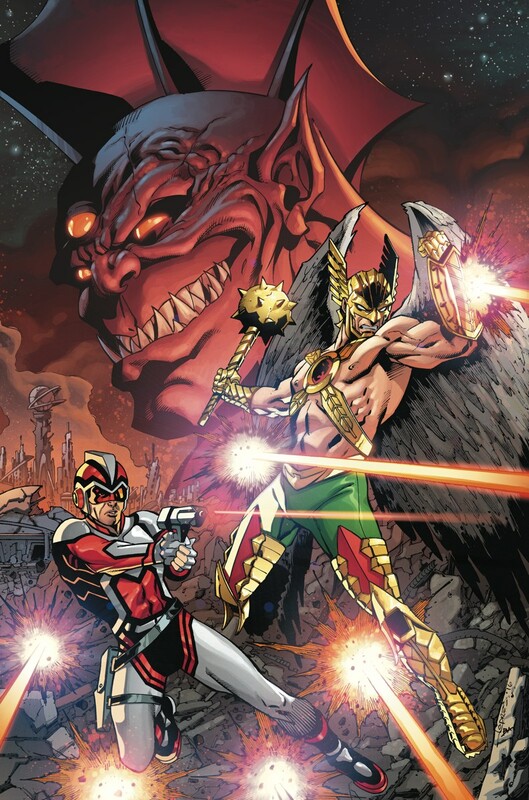 Well, that all changed today with announcement of a new miniseries starring Hawkman and Adam Strange! Get ready for Out Of Time! Residing on Earth and out of the hero game, Adam Strange finds himself trying to live a 'normal' life, until he's literally pulled back into adventure again as a seemingly normal Zeta beam transmission returns him to the planet Rann, where he hopes to be reunited with his beloved Alanna. But instead, he finds the once great city of Ranagar in ruins with millions dead, and the once peaceful Alanna is now calling for the blood of Rann's oldest enemy, Thanagar, home of the Hawkmen. "Sensing something is amiss, Strange enlists the aid of Thanagarian policeman Katar Hol, aka Hawkman, who is also trying anything possible to avert war. Together the two try and uncover who's really behind the destruction of Rann while at the same time preventing Rann and Thanagar from marching into interplanetary armageddon!" Hawkman and Adam Strange mashed up again! From the description of Thanagar, this definitely sounds like it builds on the New 52 version of the planet, with the hawk motif carrying on. The description of Hawkman as a "policeman" fits with the post-Justice League of America approach to the character, which is fine as it fits with the general theme of the Rebirth initiative ("That's familiar!"). I like Aaron Lopresti's work from his Garbageman feature from My Greatest Adventure and Weird Worlds, and the idea of him drawing a science fiction space war sounds fantastic! Marc Andreyko I am less familiar with, although a cursory glance over his credits shows that the stuff of his I have read I did enjoy (including an arc featuring Black Lightning and Blue Devil in DC Universe Presents). So this is wonderful news for this Hawkfan to see the hero get a little 4 Color attention! What about you, are you excited about this new Hawkman/Adam Strange team up? Image: Hawkman and Adam Strange: Out Of Time, 2016, Aaron Lopresti, Newsarama.